Starting a business anywhere in the world is tough. You need to have a good idea, and more than that, you need to learn how to execute that idea well. For some reason that stuck with me. Starting a business in Japan will help you learn the skills to absolutely nail the execution of your ideas, and that experience will force you to up your game in a BIG way. The thoughtful approach required to succeed in Japan will force you to adapt, learn, question and build your understanding of your customers and the people you seek to serve. Some strategies and tactics that might be a given for entrepreneurs in the West may seem completely impossible to pull off in Japan. Others that seem silly or outdated may be incredibly effective. Fighting through these challenges will make you clearer, more thoughtful and more able to accept and adapt to failure. And you will fail a lot, get used to it because that’s how you grow, and you’ll be all the better for it. Whatever your work is focused on, anyone can agree that Japan’s marketing is really weird. Because of this it is really important for you to be hyper-specific and clear about who your product is for. How well do you know what they need, want, desire and fear? What change do you want them to make? What can you visually show them that they can see themselves doing? Can you also to come up with really creative ways to demonstrate these things to your audience? It’s crazy, but there are so many elements that you can pull from this ad that are genius. It tells a compelling story, it hits on all kinds of emotional levels and it is genuinely funny and attention grabbing. This is a lesson that we can learn from advertising in Japan that might even work for some products in the west (I’m thinking of that Old Spice commercial). Entrepreneurs and business owners in Japan can learn a great deal from breaking down how Japanese companies sell their products both online and offline. It’s easy to point to images of Rola on the train and think: “She should be paying the company for all the exposure she is getting instead of their product.” The thing is, though, they wouldn’t keep doing it if it wasn’t working! This is Rola, one of the most famous celebrities in Japan. What can you learn from this as an entrepreneur? Marketing in Japan different in both big and subtle ways, and the more you see, the more you come to understand and recognise what works and what doesn’t, the better your own marketing will become. Example: A popular “Instaqueen” posts a picture of a product she loves to use, sales for that product hit the roof! A restaurant is on NHK with someone exclaiming “Oishii!” and you can’t get a table there for six weeks. You can use this to your advantage if you have built your product to have a stable conversion rate, just drive traffic and you’ll get more predictable sales than anywhere else in the world. 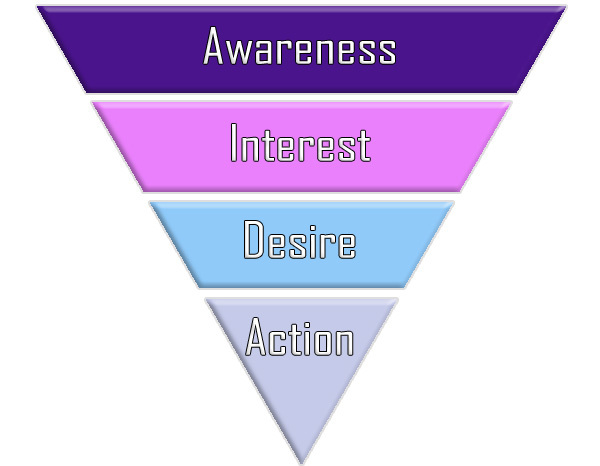 A marketing funnel that, once padded out with content and the right incentives, will help people take action. This means that if you haven’t got clear metrics laid out for your marketing funnel then you will be leaving a LOT of money on the table. Stable conversion rates means that you can afford to be hyper targeted and really specific with every process of your marketing funnel; who it’s for, who will buy at each stage, where sales drop off and what price points you should be aiming for. For all you entrepreneurs out there, the marketing funnel is critical for almost every business, and especially for online businesses trying to sell just about anything. If you want to learn more, I think the best explanation of a marketing funnel was in Dotcom Secrets by Russell Brunson. It’s a really good book with a lot of actionable and easily digested stuff for entrepreneurs anywhere in the world, and especially in online sales. Social Media advertising is different here too, and many of the rules you hear from experts in the West don’t work the same. The good news is that a lot of Japanese companies still haven’t figured out how to use social media well, and you can compete with the biggest of them if you have strong messaging and content marketing on these platforms. Facebook is popular, but other social networking providers like Line, Instagram and Twitter are increasingly important. The so-called Gen Z (the generation after millennials) aren’t using Facebook at all, and in Japan a lot of them are using LINE. All of this plays an important role for you as an entrepreneur, and knowing how to hit your market when they are, not just on the platform that you know how to use best. Facebook is of course very big in Japan as it is all over the world, but it is by no means the most commonly used social network here in all demographics. Users of Instagram, although it is owned by Facebook, are much more active on the platform, with Japanese people always on the lookout for an インスタ映え Insta-ba-eh or “chance to get a good instagram picture”. Twitter in Japan is the largest share from the Western SNS services. Japanese characters take up much less space and so even prior to the double character update, Japanese people could say an awful lot within 140 characters. Line is fast becoming the biggest social media for young people, with almost no GenZ-ers using Facebook at all. This means that you need to learn the insides and outs of new social media tools like LINE. This is a really good way to think of and build up more creative ways of getting your brand or your product out there in the Japanese market. So yeah, it might be a lot easier to run some Facebook ads in the US and get quick sales, but in Japan it just won’t work the same way. In the long term, though, this is incredibly valuable experience as you’ll be constantly learning the newest social media trends and following the crowd. No use investing heavily in a platform like lots of early adopters did in Facebook – many are struggling now with organic reach basically dead and buried this year. FYI, LinkedIn is hardly used in Japan. It’s a shame, because it is a very useful platform for professionals around the world, but they made some big mistakes while launching in Japan in 2011. Their platform became inundated with headhunters and recruiters, and LinkedIn didn’t really do enough to make sure that behaviour was squashed out, and so basically hardly and Japanese people use it. Get a business card, and use other social networks if you have to for your business contacts. To build your business up in Japan you really need to learn how to perfect your systems. Japanese companies have realised for a long time that knowing exactly who your customers are and how they will experience your product is absolutely vital to success (both in Japan and abroad). Unique to Japan, though, is how Japanese people will often act with unconscious timing that will test your business systems as far as they will go. Twitter, one of the most popular Social Networking Services in Japan is a great example. In their early days they had to rent server space during ad breaks for popular TV shows, because millions of users would tweet within seconds of one another and completely overload their system. This predictable behaviour can be an asset to a company that learns quickly what to expect from their customers. For your business this will mean making all of your systems, from orders to logistics, streamlined and easy to get through. Any bunching up at any point in your customer journey will lead to a lot of people having the same problem. Make sure to iron out your systems and make it easy for customers to give feedback, or at least make sure your techies can see where people are leaving, dropping carts, or cancelling their memberships. It can often be very hard to get feedback from Japanese people on what they didn’t like about the customer journey. If they don’t like your product they will just leave and never come back, so making sure your systems are structurally sound and any feedback or data is easily accessible will set you up for success. In Japan you will need help, backing and connections. Having good relationships with Japanese business-people is absolutely essential to help move your business forward. This is especially true in the very opaque real estate markets here, where everything relies on the 大家さん (ooyasan – landlord). You have to get on their good side, use good agents who can afford to vouch for you, which is not easy as the landlords live a long time and they don’t forget a real estate agent they don’t like. How do you do this? Well, Japanese business-people love to go out drinking. 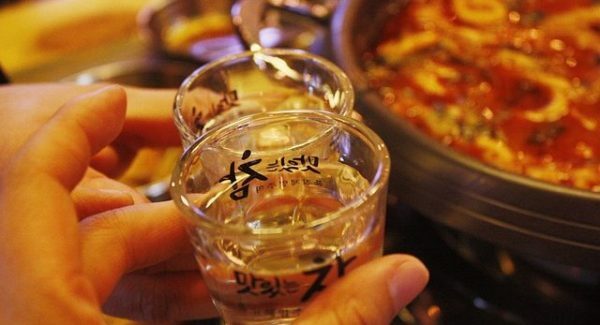 They call it 飲み会 nomikai (drink meet), and often go to a Japanese style Izakaya to get to know their business contacts. I can’t even tell you how valuable these kinds of meetings can be. We are all human, and meeting people, drinking with them and enjoying each other’s company is essential for good relationships. In Japan, you’ll be almost forced to rely more heavily on Japanese business partners, so building that trust is important. We all know the value of technology in helping us to connect with people, but as Simon Sinek talks about in his speeches, when you want to generate trust with people you have to talk to them, connect with them and put the phones and the technology away. I’m a firm believer in that and this is why I try as much as possible to meet clients at least once per month in Tokyo, and choose to do in-person coaching sessions rather than skype sessions when I have the option. Trust is huge in Japan, and if you don’t have it, you don’t get anywhere. It can be very difficult to start a successful company in Japan without the help of Japanese people. Even if you speak Japanese fluently or, as several ハーフ (haafu or half Japanese) friends have shown me, a native who doesn’t look Japanese, there is something about Japanese society that makes the ordinary consumer much more likely to trust a Japanese person than a foreigner. It’s easy to call this racism, and it might be, but really it’s a reality of doing business here so I say just find a way around it and keep on pursuing your dream. In this case that means finding Japanese partners to work with. This can be very difficult but in many industries you may find it hard to enter the market without Japanese partners. Heck, even WeWork needed to partner with SoftBank just to start in Japan. Once you get past the startup phase and you’re looking to hire people, there’s another step you need to learn how to deal with. You need to have really good hiring practices and set good expectations for your staff, unless you want to end up having to micromanage everything yourself which can easily become a reality in Japanese companies where all decisions are made at the top, and workers wait for those decisions to be handed down. You don’t want that for your business so the culture of your workplace needs to be set, or else it will set itself. While Japanese workers are traditionally very loyal and hardworking, many are also used to hierarchical structures that don’t work well in business. Examples like waiting for the CEO to sign off on tiny unimportant decisions, having to have 100% consensus from all co-workers to even bring a problem to the attention of a manager and fear of taking any responsibility at meetings are commonplace. Here’s an excerpt from a declassified CIA handbook instructing spies in the Soviet Union how to bury companies in bureaucracy and undermine them from the inside (starts on page 18). Take a close look, and if you’ve ever worked in a Japanese corporation you’ll instantly recognise this as standard operating procedure. No wonder big companies are selling off limbs to stay afloat… Your business doesn’t have to be like this. As an entrepreneur this will teach you how to get the right people on board to train your staff out of that ineffective cultural mindset, and how to set up systems that help them be more efficient than other companies in Japan. Thinking about how to solve these kind of human resource problems is essential to build up your company anywhere in the world (especially if you’re trying to 4-Hour-Work-Week it). You need good people, and you need them working at their best. If your company involves physical products, you’ll need to figure out how to move them in and out of Japan’s complicated customs laws. The above point about working with good people is definitely helpful in dealing with bureaucracy, but you’ll need to be ready for delays and come up with solutions when the papermills of government are turning slower than usual. This will force you to think on your feet and move fast when some bureaucratic nightmare throws a spanner in the works and grinds your whole operation (or even part of it) to a juddering halt. Not only that, but it will help you to preempt those problems (once they have ruined your day a few times) so that you become a capable problem spotter. Nothing trains you better than real world experience, and getting logistics down when your business relies on smooth operations will help you succeed not only in Japan but in any business you run in the future. Japan will surprise you with how many meetings people like to have here. A lot of these can be incredibly boring, but Japanese people find that it builds community and trust. You don’t have to agree. I’m not a big fan of meetings and have tried to cut them out from almost every company I have worked in, but taking an hour per day or more to have a “status meeting” is not uncommon in Japan. If they absolutely must happen, you will learn patience or find a way to reduce their impact on your day. One good thing about Japanese people loving meetings is that there are a great number of entrepreneurial meetups and events. Every single week of the year there is something interesting going on in Tokyo (less than many places in the US, but definitely enough to sink your teeth into), and there are so many entrepreneurial events that I have actually had months of “event fatigue” from just meeting too many people. I started to lose track of who I had met! Always offer your card with two hands. One handed is considered flippant and rude. Receive cards with two hands. This shows respect to the person you are receiving the card from. Turn the card to face the receiver, so they can read your name and see your logo immediately. If the person you are giving the card to outranks you, give them your card before receiving theirs. Actually read the card and treat it with care. I’m not sure if anyone actually thinks this, but the belief is that the card is an extension of the owner’s soul, and to deface it (do not write on business cards!!!) is to disrespect the person giving it to you. It’s best to carry a card case of some kind to an event so you can store the cards in a nice way. If you don’t have one on you and are given a card by surprise, putting it in your wallet (preferably out of view of the owner) is alright too, I think. You can meet so many interesting and inspiring people in Japan even without speaking any Japanese. In fact, there are a huge number of opportunities to build your career in Japan without speaking Japanese at all. Going to these events and knowing how to present yourself well may lead you to your next co-founder, a mentor or a great connection, whether that be personal or business. For business-people Japan is nothing if not a bureaucratic nightmare. All the paperwork must be in order, and there is a lot of it. Getting your entrepreneur visa or a business manager visa is a long and arduous process, or basically a full-time job for an intern for a month. Oh, and Shinagawa immigration office has very few people who speak English (as with most ward offices across Japan). At the immigration office! Luckily I speak Japanese well enough to consult about business entirely in Japanese, but this should not be the expectation. 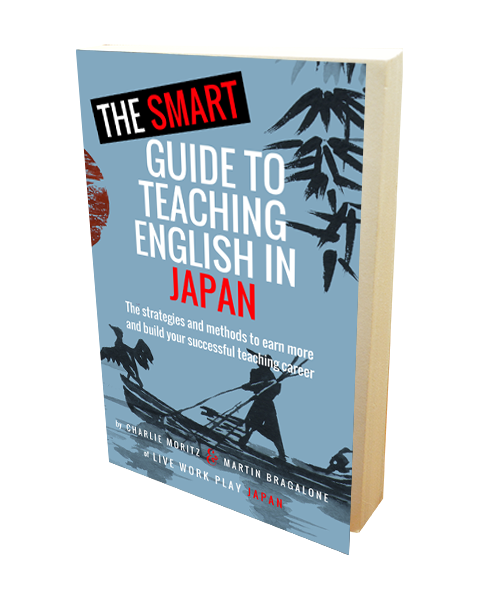 Unfortunately, that it the paradox with Japan – everyone wants to speak English, but when you really need it nobody can and may not even try. Sorting out all of these problems, while as frustrating as Windows Updates starting when you’re in a hurry, can teach you a valuable lesson about preparation, hiring good lawyers and knowing how to play the game. Never assume that the laws here are the same as the laws in the US or any other country. They aren’t. Labour laws are different (which we talked about in our article about working rights in Japan here), and so are a whole host of specific laws for every business. I found out recently that under Japanese law it is illegal to mention any other brand in your business advertising, no matter what you say. Being careful and thorough about legal and immigration matters will help keep your business running smoothly, and this knowledge and experience will help you start businesses all over the world. There’s always paperwork, and once you’ve done Japan’s, you’ll be ready for anything. Yes there are a lot of cool high tech gadgets here, but it may surprise you to learn that Japanese people are often computer illiterate… even young people!!! It shocked me when I first arrived here that almost all companies still use fax machines and keep all records on paper files in their offices (the government does this too). Aside from their iPhones, most people have no idea about anything technical, and don’t know how to do much more than open up a word document. 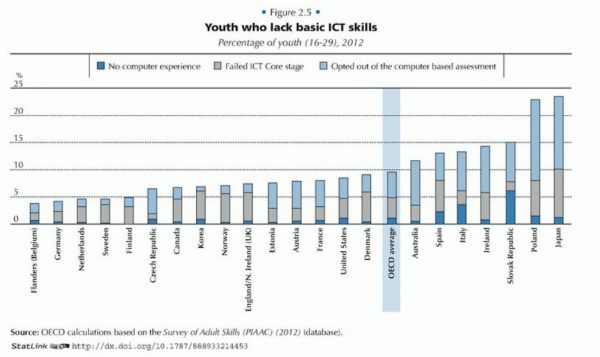 Don’t take my word for it, this OECD study from 2015 showed that 25% of young learners lacked even the most basic of computer skills (average across all countries studied was 10%, Japan was dead last). For entrepreneurs (especially in tech) this means that you’ll also need to put a lot of effort into teaching your customers how to use your product, and everything had better be user friendly. The thing is, though, that this is a really good exercise in design thinking. When you’re building your product, you’ll need to be testing each step and thoughtfully designing the UX (User Experience) to be completely accessible to people who may not be able to troubleshoot by themselves. This will make you or your team of designers much better at their job! 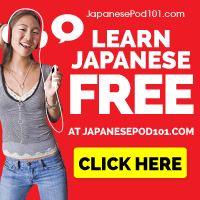 Starting in Japan is tough, but once you start here you can start anywhere! It might often seem unnecessarily hard to start a business in japan, but remember that there are a lot of motivations at play here. We don’t know for sure why things are the way they are, but we know that people like us don’t give up when faced with a challenge. Once you start in Japan, you can start anywhere, so if Japan is where you want to be then it might be time to really challenge yourself. Are you an entrepreneur in Japan? Have you been thinking of starting a business in Japan but have no idea where to begin? Make a choice to take action and post a comment below so we can point you in the right direction.